Our one-year-old puts it pretty aptly when he points and squeals a protracted ‘wooaw’ everytime he enters his room. He’s not looking at anything except his chestnut gold lampshade with wondrous big eyes. He’s not the only one. You can spend hours devouring the Snowpuppe website. Stunning images of graduating colour, geometric forms and lightweight exacting standards greet you. In short, a treat of the very best kind! In their own words ‘Studio Snowpuppe is a happy, colourful and independent studio from The Hague’. 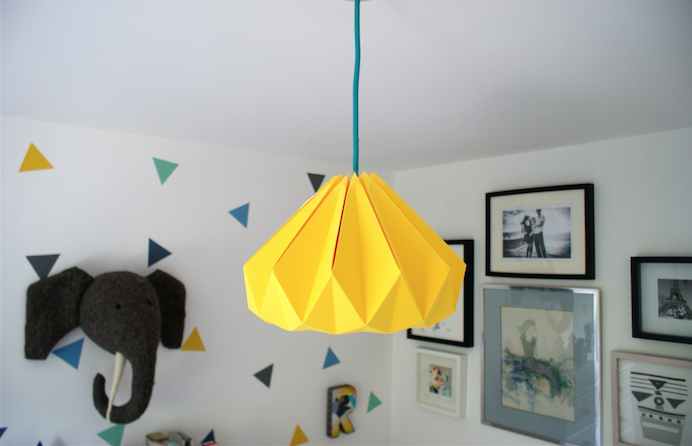 Creative duo architect Nellianna van den Baard and industrial designer Kenneth Veenenbos founded the studio in 2010 and create folded paper lampshades by hand using small-scale production techniques. The shapes created are sculptural and architectural, they hint at nature but are clean for a modern aesthetic with precise detailed folds. Using natural materials, the paper filters the cold light of energy-saving bulbs, transforming them into a cosy lampshades providing warm natural light. Any interior designer will tell you the value in that! In the renovation of our children’s room the bold gold-coloured ‘Chestnut’ was our gem of choice (but more on this later). First, we spoke with Nellianna whose hobby is to ‘enjoy my chaos and celebrate life with lots of cake’, a woman after our own heart then! Your products have such a playful bold geometric aesthetic. How and when did you start developing them? In 2006 I studied architecture abroad in Sweden. Travelling around Scandinavia I got inspired by nature’s smooth combination of force and simplicity. A good friend of mine gave me a snowman puppet with the message to follow my dreams. Together with the impression of all the beautiful Scandinavian design, this ‘Snowpuppe’ became my talisman and adventure guide. When I returned to The Netherlands I met Kenneth. We discovered our shared wonder for nature and passion for making. I had been working in architecture where building processes take five years. Kenneth was working in industrial product design where most products are made in China. We were looking for a back-to-basic product that would make the world just a bit more beautiful whilst being something that we could produce ourselves on a small but professional scale. Inspired by nature, we use elemental shapes and natural materials, mostly in paper and wood. Kenneth is the one often asking our team to stop folding lampshades to take a look at his new discoveries. The DNA of nature, its ingenious proportions and beauty inspire him to design shapes that instinctively merge our lives and surroundings. We’re proud to tell you that every lampshade that goes out to a customer, went through our hands first. Can you describe the basic design and production procedures? There must be serious trial and error when starting out! The architect Jorn Utzon liked to say, ‘I like to be on the edge of the possible.’ Most of our process is related to a series of trial and error. If you’re not afraid to do something wrong you will eventually learn what is right. Coincidence is also an important factor in our creative process. The Chestnut was created when I was designing another lamp! The chestnut is made from one sheet of butterfly paper which is FSC-certificated, colour-fast (the colour of the lampshade won’t fade), flexible for folding and available in an array of colours. In our design we mostly use warm colours and avoid using blue or black as the combination of paper and colour provides warmth to the cold light of energy-saving or LED lightbulbs. Our impact on the environment is minimised by using basic, lightweight materials and smart, folded distributing. Our aim is to consume sustainably and respect life, our surroundings and ourselves. 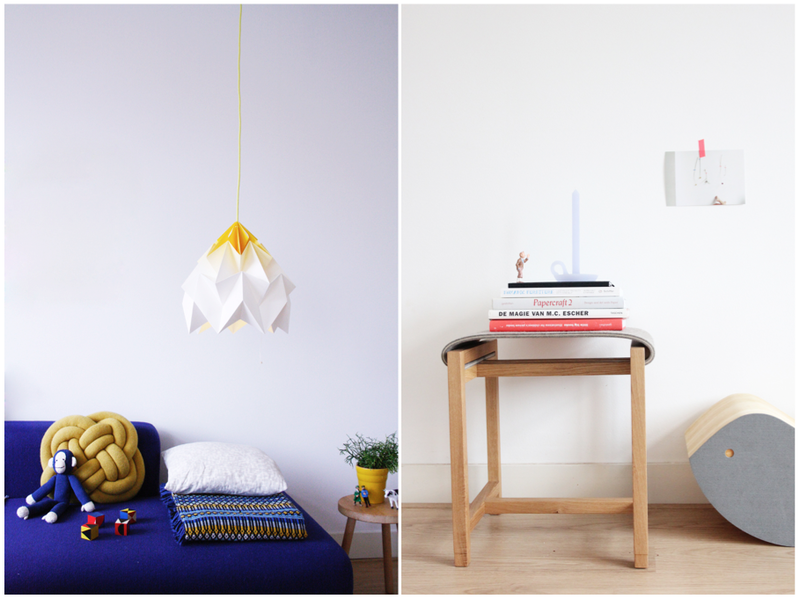 Looking at Nellianna and Kenneth’s home you can see an appreciation of pared back living with bold punches of colours in predominantly yellow, red and blue accents. This makes it a playful bright home for living! Who inspires your creativity and desire to design distinctive products? 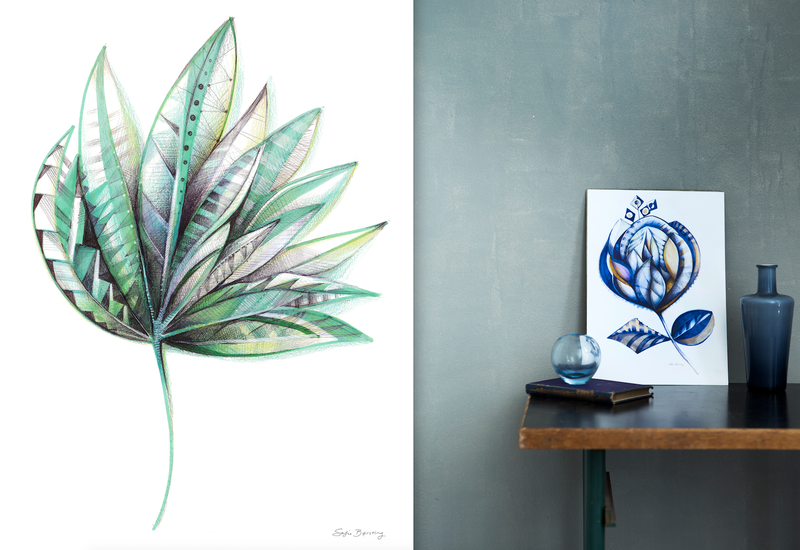 Nature, because it is real and Sofie Boersting – I am in love with her creative, botanical, animal drawings! Danish illustrator and designer Sofie Børsting is based in Copenhagen and creates detailed artwork from a combination of carefully drawn botanical elements, collage and gouache. Beautifully atmospheric, Sofie wishes these illustrations to nestle in the home amongst plants and sculpture to create the feeling of an oasis. SOFIE BØRSTING © All rights reserved. Do you dream about your folding? It seems magical to be able to create forms from a sheet of paper. A kind of ‘minimalist complexity!’. Yes it is magical and I guess I sometimes dream about it. When studying architecture I worked a lot with scale models and I preferred using paper. The thing I love most about origami is that you can use the folds as the structure of the design without adding other materials. During the folding we talk about the places where the lampshades are shipped to and sometimes we look them up on Google maps! It is very nice to see when a lampshade is shipped, for example, to a beach house in New Zealand. Origami puts a smile on people faces… almost everybody can fold a paper airplane! What tips would you offer to someone with an idea and wanting to create a business? Talk about it a lot, this way the idea becomes real and surprising things will happen! We bought a slatted radiator cover for safety from Homebase (as this was our childrens’ bedroom) and built a huge display bookshelf from 1 sheet of plywood for £30. This created a little nook at the end of one of the beds where we put our eBay find – 2 Donna Wilson mountains (we were told from an exhibition she did at Yorkshire Sculpture Park) and cushions made from some beautifully patterned tea-towels. The children sit in this nook and look up at the light in the time before bed – it emits a soft glow and the sheets spiral around almost swimming in their eyes. 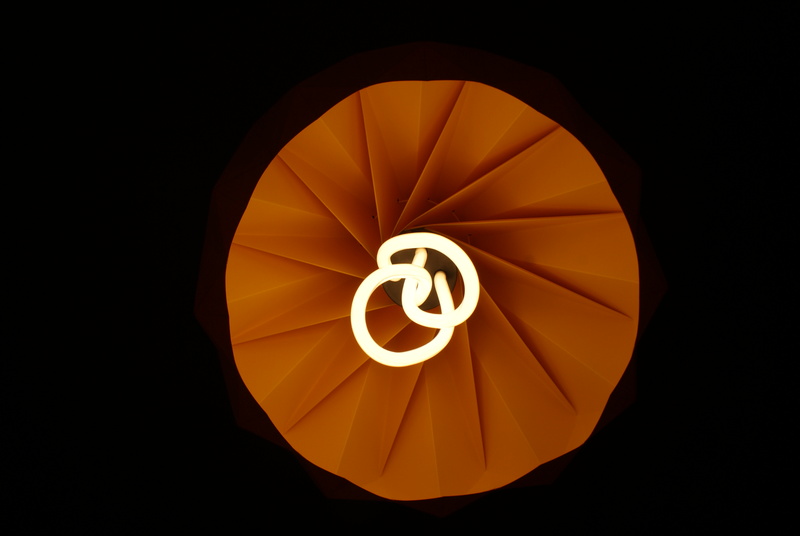 We used an energy-efficient Baby Plumen 001 light bulb in it to add to its sculptural quality too. It’s this hypnotic simplicity which sums up Snowpuppe and the chestnut is definitely a feature for any space. Enjoy! Their work is really beautiful! Thank you so much for re-blogging my post too! Love it….now are you available to do my children’s rooms too?! Of course! 🙂 Do you have a mood board/ Pinterest board of inspiration in full swing? Would love to see. Next article Little Greene | Transform your experience of a space!